In science, the most exciting expression isn’t “Eureka!” It’s “Huh?” Michael Hawley. 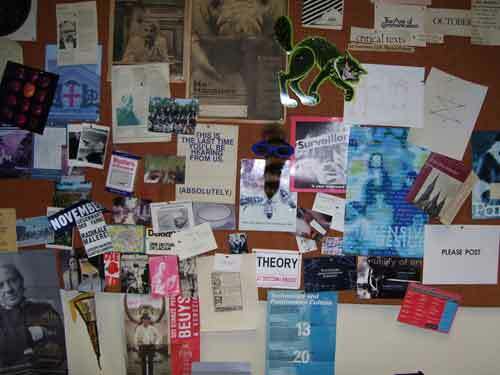 This bulletin board was in my office from 1980 until just the other day, when I moved to a new space. This blog is a kind of inhabitable assemblage, whose point of departure is whatever that collection amounted to. The dynamic here is an unfolding of an inquiry that cyrstallizes regularly into seminars. Comments welcome. “Heuretics” refers to the use of theory for the invention of new texts (poetics of any sort). It is listed in the O.E.D. as obsolete or rare, and paired with “hermeneutics,” the use of theory for the interpretation of existing texts. The purpose of this blog is to develop and apply heuretics. The primary target of this experiment is “electracy,” the apparatus of digital technology. 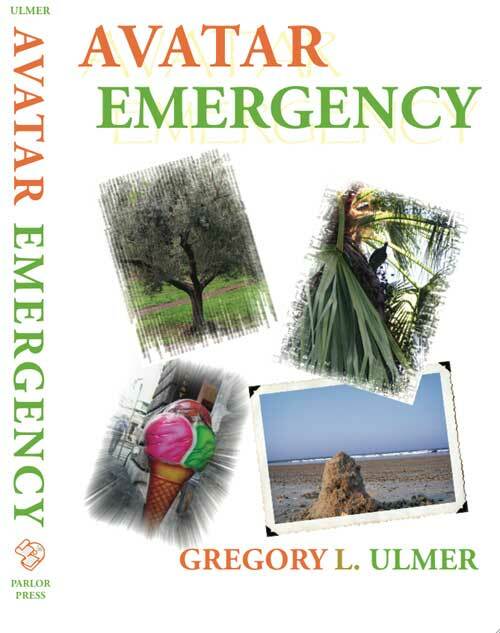 This website supported research and teaching that culminated in the publication of Avatar Emergency, now available from Parlor Press. What is the significance of the header scene? (Gregory Ulmer is Professor of English and Media Studies at the University of Florida). Your self-portrait reminds me of the miriad flow of old and new themes in my own life – you ave chosen a great image to represent the complexity of being you! I am enjoying this process of ‘recognition’ and anticipate moe to come – communication has become one of my areas of interest – visual, literary, and all of the other means of communicating through types, themes, iconic symbols and allusion. JanW. I “have a complaint or do something about it” as John Cage might say. Text Book needs a section on sentences. good to find you t/here. Nice suggestion about sentences. The permissions cost so much for the third ed. of Text Book that probably there will not be a fourth. Maybe need a TB blog? Just hours after my presentation I get a post on my blog about possibly publishing on some website. The author is this teacher/author who actually likes my posts! …Just one of life’s many surprises!